There's never been a lot to see in suburban Glenroy, 13 kilometres north of the Melbourne CBD. A golf course, a creek, a few rundown shopping strips and streets lined with 1950s clinker-brick houses is about it. One day in October 1982, though, an asteroid crashed into Sewell Reserve in the middle of town. Malcolm Denzil Marshall had landed. One of the great lost stories of Melbourne club cricket actually began a summer earlier, when local sub-district club Moorabbin acted on a tip-off that several of the touring West Indians were keen on some off-season work. The club pulled off the coup of the summer when captain-coach Michael Moss and lawyer Peter Ewan flew into town during the Adelaide Test in February 1982 and with none other than Viv Richards watching on, signed up a 12-Test-old Marshall in his hotel room. In 1982, Melbourne club cricket was a vastly different beast. Domestic schedules were not as crammed and there were no junior pathways and centres of excellence. If a teenager had talent he was simply thrown in at the deep end and often set upon by grizzled veterans. Fail with the bat and you might wait two weeks, perhaps longer, for another go. Helmets were an uncommon sight, received with nothing friendlier than curiosity. Victorian first-class players also featured regularly at the highest standard - the Victorian Cricket Associations' district league - because few then commanded a place in the Test side and only the Sheffield Shield and small-fry McDonald's Cup schedules intruded. Inter-suburban rivalries were strong and so too the standard of play. One rung below but with no great drop in intensity was the sub-district competition that was soon to feature Marshall, who at the time of signing was the first active international to feature in the league. This was big news in clubland. Very big news. When Marshall put pen to paper that day in Adelaide he was nearly 24 years old, as good as penniless, and labouring badly under the strain of a debilitating back injury. But if he thought he was signing up for a lucrative summer holiday, where he could be sympathetically nursed back to health, then he would have been woken up by Moss' summary of his injuries. "We aren't worried about his back injury," Marshall's new skipper bluntly told the Age's Peter McFarline. "He has a whole season in England to get over that." On that Saturday at the Sewell Reserve, things began farcically. The league had shifted Marshall's first game to Glenroy for its proximity to the airport at which he was due to arrive on the morning of the game. But a flight delay and playing regulations meant the game actually started without him. Nervous Moorabbin president Dennis King eventually scooped up his new opening bowler and arrived at the ground half an hour after the game had begun, perhaps a little happier once he realised that opponents Broadmeadows had already slumped to 25 for 5. Through the off season league players had been abuzz over the prospect of testing themselves against the likes of Marshall. His signing triggered others too. Marshall's West Indies team-mate Desmond Haynes would play for nearby Dandenong and the English quick Gladstone Small at Balwyn. Colin Croft was another signing for Brighton but he withdrew after accepting an offer to go on a rebel tour to South Africa. Among the locals keyed up to take on Marshall was Robert "Basher" Fisher, a cricketer whose far humbler talents had taken him only as far as the 3rd XI of a cross-town club ("only park cricket" in his words). Inspired by the arrival of the league's new stars, Fisher had embarked on an extensive pre-season fitness campaign in the hope of winning a place in the Broadmeadows first team to face Moorabbin. It worked, and he slotted in at No. 9 that day with the expectation he'd face Marshall. By the reckoning of Moorabbin wicketkeeper Alan Marion, Marshall walked onto the field at around 2.15pm (club games generally began late morning). Upon registering the change in personnel both Broadmeadows batsmen immediately called for helmets, close to an unprecedented event for most watching. Marion knew roughly what to expect when his new team-mate's first ball came darting down the pitch, but nothing could prepare him for the reality of the impact as it reached him. "As a wicketkeeper I'm standing there terrified about how the ball's going to come out," he says, "and the first ball comes out at about 135 or 140kph, three yards down the leg side and slapping into the gloves. "I was counting my fingers." Marion had the best seat in the house that summer, marvelling at the things Marshall did with the ball. "It was more the way - particularly once he got his line - he could make the ball lift off the wicket and just use every sinew in his body to get the ball through at that pace." One of Marion's first questions was to ask how far back he should stand to handle the steepling bounce. "[David] Murray is a very short man so he has to stand close before the ball gets up," was Marshall's helpful tip. Against Broadmeadows, Marshall was expectedly rusty to begin with, but he soon found his range. He broke through for a wicket, by which time the opposition was 70 for 7 and staring at a hiding. That wasn't all. By the time Fisher strode to the crease Marshall had spent a decent period of his spell being wound up by Broadmeadows captain Rex Bennett, something of a legend in west Melbourne, and that day Marshall's antagonist with bat and tongue. Watching Marshall from side-on moments before he arrived at the crease it seemed to Fisher as though the ball simply disappeared into thin air once it left the hand. "I had never experienced anything like it," he remembers. Fisher took guard and "proceeded to miss the next three outswingers by a lot". Team-mates later claimed he was reflexively backing away to square leg but he doesn't remember it that way. Marshall wasn't impressed. Before he returned to his marker for the final delivery of the over Fisher disarmed him by apologising. "I'm sorry, Mr Marshall, but that's the best I can do." Marshall smiled and finished by swinging the ball in appreciably and drawing from Fisher a hurried inside edge onto the pads. The ball went away to fine leg, allowing "Basher" a single to get off the mark. Jet-lagged and probably spent, Marshall was promptly withdrawn from the attack and Broadmeadows somehow scratched out 125. Moorabbin's reply the following Saturday (the games were typically played over consecutive Saturdays) was washed out but that didn't matter to Fisher. 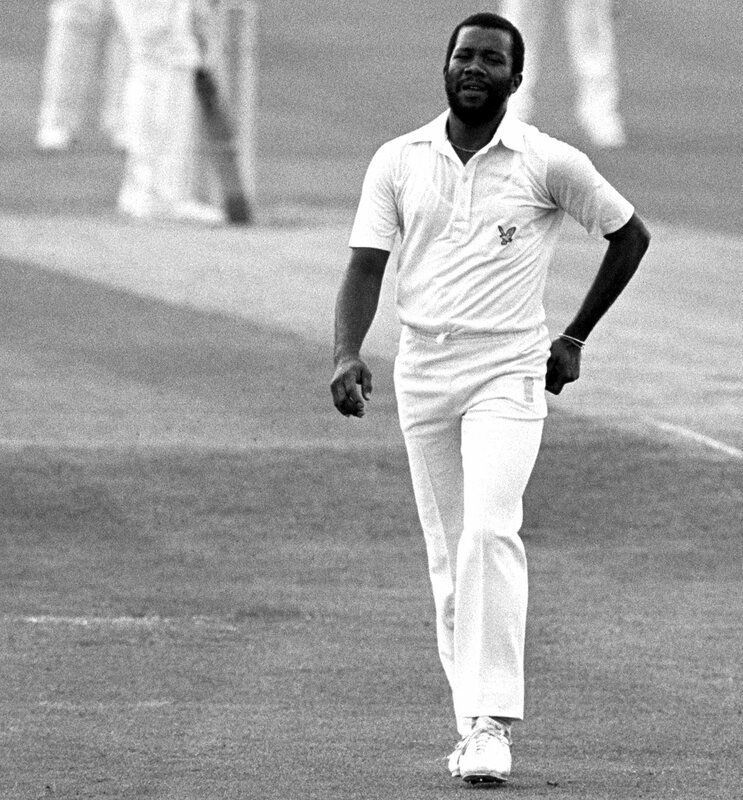 For 33 years now, he is the teller of one of the better amateur sporting anecdotes: "The day I hit Malcolm Marshall out of the attack." The 1981-82 summer in which he first signed for Moorabbin had been a dispiriting and lonely time for Marshall, then still some way from the world-beating bowler he would become. Life was uncertain, his employment precarious. "Australia 1981-82 should have provided my career with the springboard it needed," he would explain in his autobiography Maco. "Instead I returned from a bitter, pain-filled tour a virtual invalid on a desperate search for a cure for a severe back injury." In all likelihood Marshall would have been picked for the Tests at some point that summer. Instead he struggled with crippling muscular spasms around the spine. He lurched in vain from one Australian specialist to another looking for a solution. "I seriously doubted if I would ever play again," he wrote, "and in gloomier moments I pondered also on the possibility that the injury might even be permanent." Not that he always showed any ill effects when he did make it onto the field. Eleven wickets came in the pair of tour matches he managed and eight ODIs brought 12 wickets, though all at significantly reduced pace. Unaware that he was playing through pain, some Australian fans assumed he lacked the pace and penetration of his bigger-name partners. He spent the summer fretting that the rug was about to be pulled from under him and that his career might be over before it had really begun. Would Hampshire cut him loose if he couldn't fulfil his bowling duties through the English summer that followed? He returned to Barbados "a deeply troubled and worried man". Fortunately a solution was near, in the shape of Edmund Sealey, the Barbados athletics squad physiotherapist. Sealey spent a month massaging Marshall's tender lower-back muscles to freedom, "easing the pain and at the same time breathing new life into my whole spirit," as Marshall wrote. An accompanying routine as uncomplicated as 100 sit-ups a day also worked wonders; it became a habit Marshall would maintain through the rest of his career. When he returned to Hampshire everything starting clicking into place. Physically resurrected, Marshall began with the intention of bowling within himself. But a fiery run-in with Worcestershire and Pakistan's Younis Ahmed encouraged him to steam in off his long run, removing not only the batsman but any remaining inhibitions Marshall may have had about extending his body. The results of that revelatory English summer were scarcely believable: 134 first-class wickets at 15.73 and a further 20 scalps in the John Player League. In the previous two seasons combined he had managed 134 first-class wickets. Marshall had signed with Moorabbin not entirely certain he would ever be the same bowler again or, far more dramatically, whether he'd even return to Australia. Now his ambition was nothing less than to assert himself as the world's best fast bowler. 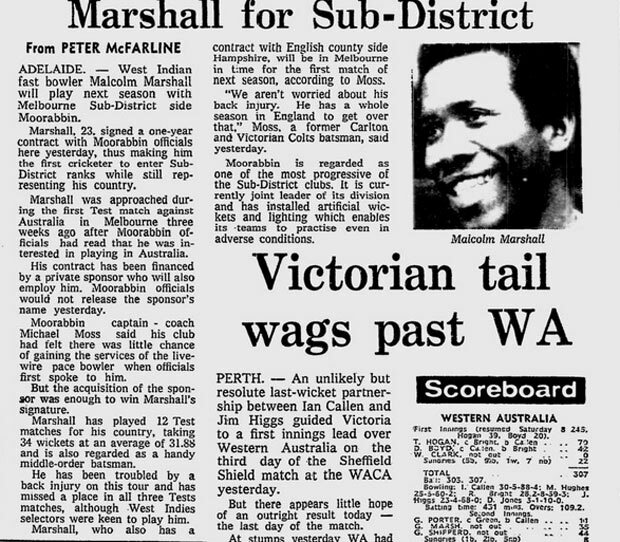 The playing side of Marshall's brief, largely ignored stint with Moorabbin barely rates a mention in Maco. "I took 25 wickets without exerting myself unduly," he wrote. "Desmond [Haynes], Hartley [Alleyne, who was soon cut by district side St Kilda after doing more partying than wicket-taking] and myself were in 'digs' and we enjoyed ourselves as we prepared for the more rigorous cricket ahead." Big decisions beckoned too. Sitting in his Melbourne apartment one day Marshall picked up the phone and heard the voice of South African cricket administrator Dr Ali Bacher. A West Indies rebel tour was imminent and there was a £50,000 cheque with Marshall's name on it. A plane ticket to Johannesburg was waiting in the offices of a Melbourne travel agent. Marshall immediately went across town and consulted Alleyne and Haynes - both of whom had also received offers of significant generosity - but quickly decided that Bacher couldn't be trusted. Rather than the vulnerable fringe-dweller Bacher had him pegged as, Marshall was too proud a Barbadian; he was actually emboldened rather than seduced by news that Croft had defected, because a fast-bowling position in the West Indies side was now his to cement. Marshall's refusal didn't reach the press. One day, while coaching juniors on the Mornington Peninsula - an hour south of Melbourne - Marshall picked up a copy of the Age that claimed he was already in Johannesburg and ensconced in rebel ranks. His position never changed, though, not even when Bacher's offer later reached $1 million. "Malcolm Marshall," concluded a disbelieving Bacher, "you are a very good cricketer but a foolish young man." The money on offer to Marshall at Moorabbin was certainly nothing to be sneezed at. He was in no position to refuse it at that point in his career, but he brought much to the club. Aside from playing and coaching, he motored around town in a sponsored Ford Falcon (Haynes got a less roomy Laser) to work the odd promotional job. When the journalist Howard Leigh caught up with him for an interview for the Australian Cricketer, Marshall was "with a bevy of lovely ladies modeling snazzy summer gear on stage at Westfield Shopping Centre at Doncaster". Marion remembers the impact Marshall and his fellow pros had on the local nightlife. 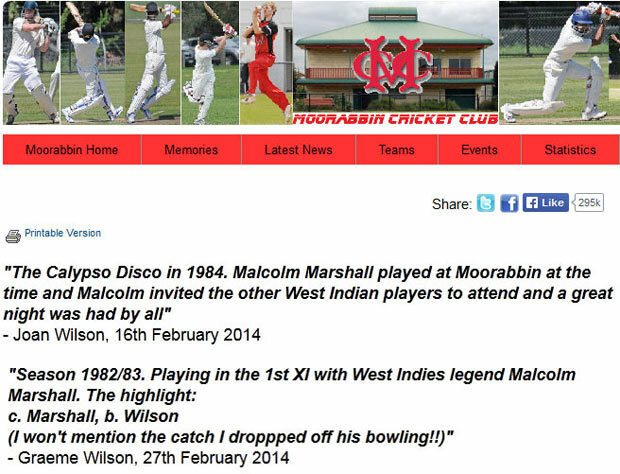 In the social club one night, Moorabbin hosted its first and presumably only "Calypso Disco", attended by a host of visiting West Indian players. Haynes walked happily among partying locals, passing them hollowed-out watermelons full of rum and coke to get things started. If Haynes' summer-long column for the local Dandenong Journal contained details of even 5% of his alleged off-field activities it would have been quite a read. For a fundraising game against the St Kilda Football Club, Marshall had to be roused from bed and rushed to the ground to keep 4000 paying patrons happy. Otherwise he endeared himself to all by mentoring Moorabbin's juniors and - according to local journalist Terry Brown - romancing a quite staggering procession of women. The superstars found the actual cricket far less festive. 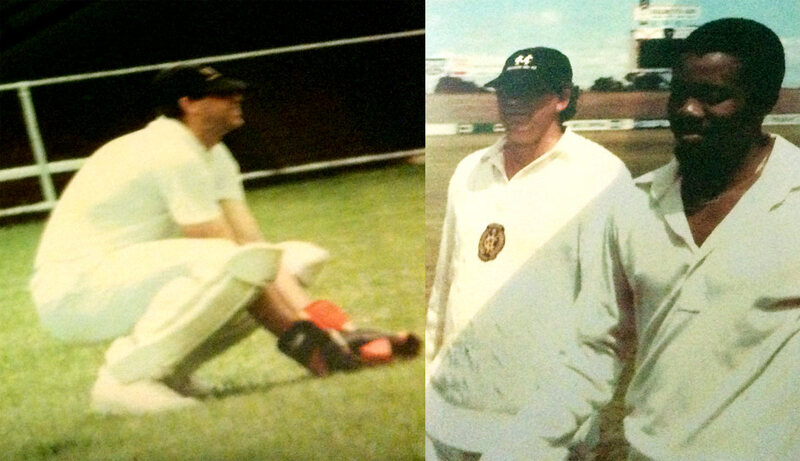 Only 16 spectators were on hand to watch the 26-year-old Haynes register his first century against Oakleigh. By the end of the summer Marshall hadn't exactly cut a swathe through the batsmen. 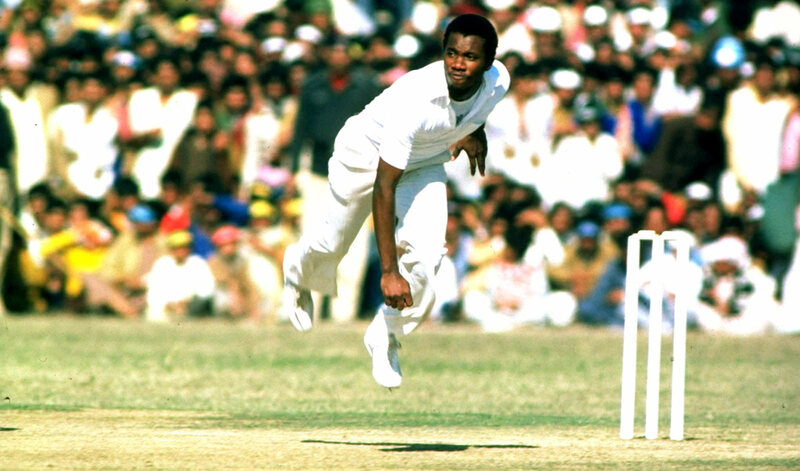 "Malcolm Marshall's influence was only minor," concluded local cricket scribe Geoff Reilley at season's end, though local folklore suggests otherwise. Everyone who played that season seems to have a Marshall story. Former Mount Waverley cricket club president Keith Frampton recalled the game in which his side's star batsmen Gary McRorie, Wayne Hynes and John Morris copped Marshall's full armoury. Incited by some verbal jousting from behind the fence, Marshall doubled the length of his approach and unleashed a spell so ferocious that an outside edge cleared the boundary on Mount Waverley's ground, one of Melbourne's largest. Marion corroborates this, adding that it was one of only two occasions that summer when Marshall really cranked it up. "He was bowling extremely fast on a wicket that was a bit up and down. I was basically taking every ball way above my head and at pace." The other occasion came at home against Preston, when Marshall was surprised at the audacity of a helmeted batsman who drove him through covers for two consecutive and sublime boundaries. "Who's this guy?" he angrily inquired of a team-mate at mid-off. It was 36-year-old former Australian Test man Richie Robinson, also newly arrived in the league as a big-name signing. It had been five years since he featured in Australia's 1977 Ashes campaign and only a season since he left first-class cricket. This day he had taken no chances against Marshall, batting with his head protected. Marshall had seen enough. After stewing briefly he picked up his bowling marker and theatrically walked it out another 10-15 metres closer to the fence at long-off. Immediately he cracked Robinson on the side of the head with a venomous bouncer. Somehow Robinson regained his composure to face the next ball, but it was just as quick and sent his middle stump cartwheeling towards Marion and his deep-set cordon. Then there was the fixture against Brunswick. As Moorabbin's players gathered in the changing rooms before play Marshall told them the moment had arrived to unleash his "vampire balls". Seeing their puzzlement, he explained to them: "It just nicks their neck on the way through." Suddenly a stint in the slips didn't seem like the worst way to spend the afternoon. After seven games and a modest 25 wickets, Marshall was done with sub-district cricket and gone for good, enveloped by a fast-growing fame as the most ruthless and potent fast bowler in world cricket. Was he just going through the motions when he turned out for Moorabbin? Probably, but those who were there share memories that sound like fever dreams, events you can only half-believe actually transpired. Beyond the scattered stumps, crumped helmets and damaged grandstands, how does Marion remember his most famous and fearsome former team-mate? "Just one hell of a nice bloke."